It’s been a bit smoggy out. The view outside my office, today. 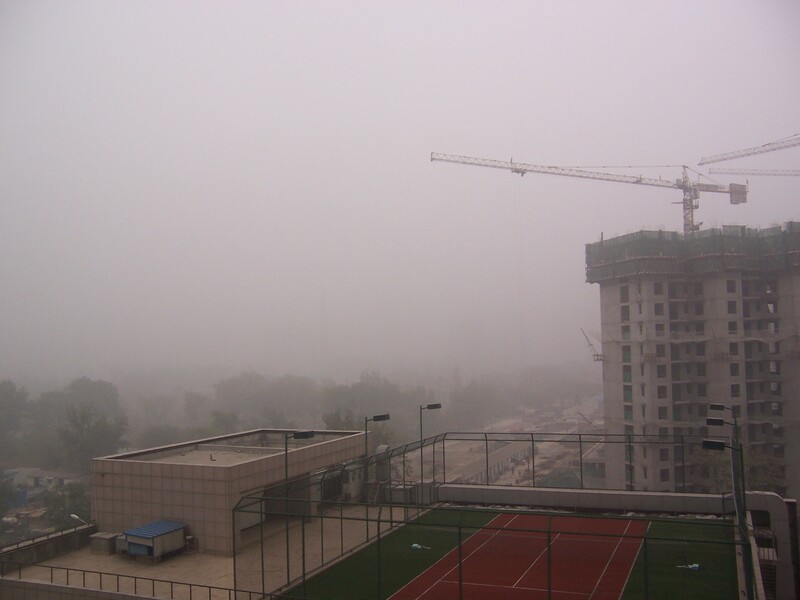 I first moved to Beijing in September 2007. That year the smog was absolutely terrible. Here’s a photo I took from the window of my apartment. Not visible in this picture is the tower block in the near-distance. That’s about 50 meters visability, in the daytime. The next year was 2008, the year of the Olympics. Inconveniences like migrant workers, English teachers, cars and factories were moved out of the city. These (well, the last two) cut down the polution quite significantly, and some clean-air measures were kept after the games were over. When I came back in 2009 the sky generally looked a lot clearer, but things were slipping back. The first sign of trouble was last year when the US embassy (the only reliable judges of air quality here) gave up measuring and just described the air as “crazy bad”. Every year, in mid-November, someone somewhere presses a button and turns on all the central heating for the city. This means a huge spike in emissions from the city’s coal power stations. These aren’t located at some convenient out-of-town industrial area. One I know of is in the central business district, just behind a shopping centre with Gucci and Louis Vutton boutiques. The heating is charged at a flat rate, based on how large your house is, and cannot be controlled. Many people think it’s too hot and leave their windows open. Nobody has insulation or even double glazing. It’s been nearly a month since the heating was turned on, and there hasn’t been a break in the smog for about two weeks. 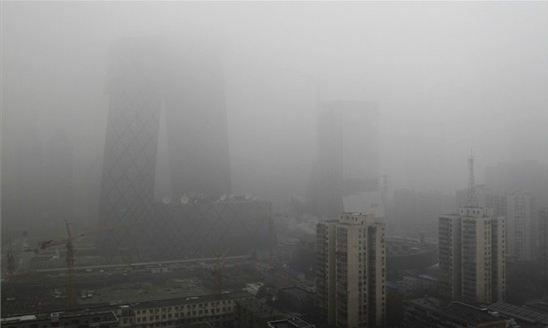 Today was the worst day so far, so bad that more than 200 flights were cancelled and people were being advised to stay at home, or leave the house only with face masks. If it was ever a joke, it’s not any more. There’s a fairly astonishing gallery of the worst of the smog here.